Charles IV[note 1] (18/19 June 1294 – 1 February 1328), called the Fair (le Bel) in France and the Bald (el Calvo) in Navarre, was the fifteenth and last king of the direct line of the House of Capet, King of France and King of Navarre (as Charles I) from 1322 to his death. Charles was the third son of Philip IV; like his father, he was known as "the fair" or "the handsome". Beginning in 1323 Charles was confronted with a peasant revolt in Flanders, and in 1324 he made an unsuccessful bid to be elected Holy Roman Emperor. As Duke of Guyenne, King Edward II of England was a vassal of Charles, but he was reluctant to pay homage to another king. In retaliation, Charles conquered the Duchy of Guyenne in a conflict known as the War of Saint-Sardos (1324). In a peace agreement, Edward II accepted to swear allegiance to Charles and to pay a fine. In exchange, Guyenne was returned to Edward but with a much-reduced territory. When Charles IV died without a male heir, the senior line of the House of Capet, descended from Philip IV, became extinct. He was succeeded in Navarre by his niece Joan II and in France by his paternal first cousin Philip of Valois. However, the dispute on the succession to the French throne between the Valois monarchs descended in male line from Charles's grandfather Philip III of France, and the English monarchs descended from Charles's sister Isabella, was a factor of the Hundred Years' War. By virtue of the birthright of his mother, Joan I of Navarre, Charles claimed the title Charles I, King of Navarre. From 1314 to his accession to the throne, he held the title of Count of La Marche and was crowned King of France in 1322 at the cathedral in Reims. Unlike Philip IV and Philip V, Charles is reputed to have been a relatively conservative, "strait-laced" king – he was "inclined to forms and stiff-necked in defence of his prerogatives", while disinclined either to manipulate them to his own ends or achieve wider reform. Charles married his first wife, Blanche of Burgundy, the daughter of Otto IV, Count of Burgundy, in 1308, but Blanche was caught up in the Tour de Nesle scandals of 1314 and imprisoned. After Charles assumed the throne he refused to release Blanche, their marriage was annulled, and Blanche retreated to a nunnery. His second wife, Marie of Luxembourg, the daughter of Henry VII, the Holy Roman Emperor, died following a premature birth. Charles married again in 1325, this time to Jeanne d'Évreux: she was his first cousin, and the marriage required approval from Pope John XXII. Jeanne was crowned queen in 1326, in one of the better recorded French coronation ceremonies. The ceremony represented a combination of a political statement, social event, and an "expensive fashion statement"; the cost of food, furs, velvets, and jewellery for the event was so expensive that negotiations over the cost were still ongoing in 1329. The coronation was also the first appearance of the latterly famous medieval cook, Guillaume Tirel, then only a junior servant. During the first half of his reign Charles relied heavily on his uncle, Charles of Valois, for advice and to undertake key military tasks. Charles of Valois was a powerful magnate in his own right, a key advisor to Louis X, and he had made a bid for the regency in 1316, initially championing Louis X's daughter Joan, before finally switching sides and backing Philip V. Charles of Valois would have been aware that if Charles died without male heirs, he and his male heirs would have a good claim to the crown. A Charles IV tournois coin; Charles debased the French coinage during his reign, creating some unpopularity. Charles came to power following a troublesome two years in the south of France, where local nobles had resisted his elder brother Philip V's plans for fiscal reform, and where his brother had fallen fatally ill during his progress of the region. Charles undertook rapid steps to assert his own control, executing the Count of L'Isle-Jourdain, a troublesome southern noble, and making his own royal progress. Charles, a relatively well educated king, also founded a famous library at Fontainebleau. During his six-year reign Charles' administration became increasingly unpopular. He debased the coinage to his own benefit, sold offices, increased taxation, exacted burdensome duties, and confiscated estates from enemies or those he disliked. He was also closely involved in Jewish issues during the period. Charles' father, Philip IV, had confiscated the estates of numerous Jews in 1306, and Charles took vigorous, but unpopular, steps to call in Christian debts to these accounts. Following the 1321 leper scare, in which numerous Jews had been fined for their alleged involvement in a conspiracy to poison wells across France through local lepers, and Charles worked hard to execute these fines. Finally, Charles at least acquiesced, or at worst actively ordered, in the expulsion of many Jews from France following the leper scare. Charles inherited a long-running period of tension between England and France. Edward II, King of England, as Duke of Aquitaine, owed homage to the King of France, but he had successfully avoided paying homage under Charles' older brother Louis X, and had only paid homage to Philip V under great pressure. Once Charles took up the throne, Edward attempted to avoid payment again. One of the elements in the disputes was the border province of Agenais, part of Gascony and in turn part of Aquitaine. Tensions rose in November 1323 after the construction of a bastide, a type of fortified town, in Saint-Sardos, part of the Agenais, by a French vassal. Gascon forces destroyed the bastide, and in turn Charles attacked the English-held Montpezat: the assault was unsuccessful, but in the subsequent War of Saint-Sardos Charles' trusted uncle and advisor, Charles of Valois, successfully wrested control of Aquitaine from the English; by 1324, Charles had declared Edward's lands forfeit and had occupied the whole of Aquitaine apart from the coastal areas. 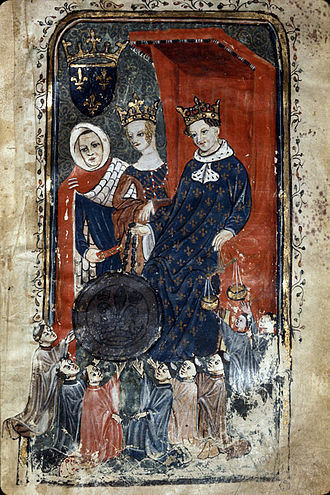 A near-contemporary miniature showing the future Edward III giving homage to Charles IV under the guidance of Edward's mother, and Charles' sister, Isabella, in 1325. Charles's sister Isabella was married to King Edward and was sent to France in 1325 with the official mission of negotiating peace with her brother; unofficially, some chroniclers suggested that she was also evading Hugh Despenser the elder and Hugh the younger, her political enemies in England. 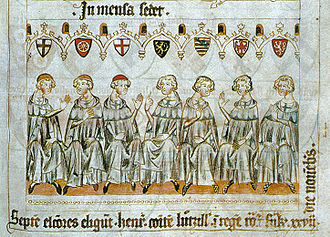 Charles had sent a message through Pope John XXII to Edward suggesting that he was willing to reverse the forfeiture of the lands if Edward ceded the Agenais and paid homage for the rest of the lands. The Pope in turn had proposed Isabella as an ambassador. Charles met with Isabella and was said to have welcomed her to France. Isabella was joined by the young Prince Edward later that year, who paid homage to Charles on his father's behalf as a peace gesture. Despite this, Charles refused to return the lands in Aquitaine to the English king, resulting in a provisional agreement under which Edward resumed administration of the remaining English territories in early 1326, whilst France continued to occupy the rest. Meanwhile, Isabella had entered into a relationship with the exiled English nobleman Roger Mortimer and refused to return to England, instead travelling to Hainaut, where she betrothed Prince Edward to Philippa, the daughter of the local Count. She then used this money, plus an earlier loan from Charles, to raise a mercenary army and invade England, deposing her husband Edward II, who was then murdered in 1327. Under Isabella's instruction, Edward III agreed to a peace treaty with Charles: Aquitaine would be returned to Edward, with Charles receiving 50,000 livres, the territories of Limousin, Quercy, the Agenais, and Périgord, and the Bazas county, leaving the young Edward with a much reduced territory. Charles faced fresh problems in Flanders. The Count of Flanders ruled an "immensely wealthy state" that had traditionally led an autonomous existence on the edge of the French state. The French king was generally regarded as having suzerainty over Flanders, but under former monarchs the relationship had become strained. Philip V had avoided a military solution to the Flanders problem, instead enabling the succession of Louis as count – Louis was, to a great extent, already under French influence, having been brought up at the French court. Over time, however, Louis' clear French loyalties and lack of political links within Flanders itself began to erode his position within the county itself. In 1323 a peasant revolt led by Nicolaas Zannekin broke out, threatening the position of Louis and finally imprisoning him in Bruges. Charles was relatively unconcerned at first, since in many ways the revolt could help the French crown by weakening the position of the Count of Flanders over the long term. By 1325, however, the situation was becoming worse and Charles' stance shifted. Not only did the uprising mean that Louis could not pay Charles some of the monies due to him under previous treaties, the scale of the rebellion represented a wider threat to the feudal order in France itself, and to some it might appear that Charles was actually unable, rather than unwilling, to intervene to protect his vassal. Accordingly, France intervened. In November 1325 Charles declared the rebels guilty of high treason and ordered them excommunicated, mobilising an army at the same time. Louis pardoned the rebels and was then released, but once safely back in Paris he shifted his position and promised Charles not to agree to any separate peace treaty. Despite having amassed forces along the border, Charles' military attentions were distracted by the problems in Gascony, and he eventually chose to settle the rebellion peacefully through the Peace of Arques in 1326, in which Louis was only indirectly involved. Charles gave his name to his nephew, Charles IV, Holy Roman Emperor, shown here giving homage to his patron. Charles was also responsible for shaping the life of his nephew, Charles IV, Holy Roman Emperor. Charles IV, originally named Wenceslaus, came to the French court in 1323, aged seven, where he was taken under the patronage of the French king. Charles gave his nephew a particularly advanced education by the standards of the day, arranged for his marriage to Blanche of Valois, and also renamed him. The crusades remained a popular cause in France during Charles' reign. His father, Philip IV, had committed France to a fresh crusade and his brother, Philip V, had brought plans for a fresh invasion close to execution in 1320. Their plans were cancelled, however, leading to the informal and chaotic Shepherds' Crusade. Charles entrusted Charles of Valois to negotiate with Pope John XXII over a fresh crusade. Charles, a keen crusader who took the cross in 1323, had a history of diplomatic intrigue in the Levant – he had attempted to become the Byzantine emperor earlier in his career. The negotiations floundered, however, over the Pope's concerns whether Charles IV would actually use any monies raised for a crusade for actual crusading, or whether they would be frittered away on the more general activities of the French crown. Charles of Valois's negotiations were also overtaken by the conflict with England over Gascony. After the death of Charles of Valois, Charles became increasingly interested in a French intervention in Byzantium, taking the cross in 1326. Andronicus II responded by sending an envoy to Paris in 1327, proposing peace and discussions on ecclesiastical union. A French envoy sent in return with Pope John's blessing later in the year, however, found Byzantium beset with civil war, and negotiations floundered. The death of Charles the next year prevented any French intervention in Byzantium. Charles IV died in 1328 at the Château de Vincennes, Val-de-Marne, and is interred with his third wife, Jeanne d'Évreux, in Saint Denis Basilica, with his heart buried at the now-demolished church of the Couvent des Jacobins in Paris. Like his brothers before him, Charles died without a surviving male heir, thus ending the direct line of the Capetian dynasty. Twelve years earlier, a rule against succession by females, arguably derived from the Salic Law, had been recognised – with some dissent – as controlling succession to the French throne. The application of this rule barred Charles's one-year-old daughter Mary, by Jeanne d'Évreux, from succeeding as the monarch, but Jeanne was also pregnant at the time of Charles' death. Since she might have given birth to a son, a regency was set up under the heir presumptive Philip of Valois, son of Charles of Valois and a member of the House of Valois, the next most senior branch of the Capetian dynasty. After two months, Jeanne gave birth to another daughter, Blanche, and thus Philip became king and in May was consecrated and crowned Philip VI. Edward III of England argued, however, that although the Salic law should forbid inheritance by a woman, it did not forbid inheritance through a female line – under this argument, Edward should have inherited the throne, forming the basis of his claim during the ensuing Hundred Years War (1337–1453). Joan (1315 – 17 May 1321). Louis (born and died March 1324). Blanche (1 April 1328 – 8 February 1393). Thus, five of Charles' six children (including two sons) died young, and only his youngest daughter, Blanche, survived to adulthood. Incidentally, Blanche was born posthumously, two months after Charles died. During those two months, Charles' first cousin, Philip the fortunate, served as regent pending the birth of the child. Once a female child was born, the regent, who was the nearest male heir of the late king, succeeded to the throne and became the first king of France from the House of Valois. Charles is a character in Les Rois maudits (The Accursed Kings), a series of French historical novels by Maurice Druon. He was portrayed by Gilles Béhat [fr] in the 1972 French miniseries adaptation of the series, and by Aymeric Demarigny [fr] in the 2005 adaptation. ^ In the standard numbering of French Kings, which dates to the reign of Charlemagne, he is actually the fifth such king to rule France, following Charlemagne (Charles the Great), Charles the Bald, Charles the Fat, and Charles the Simple. ^ a b c d e f g h i Kibler, p.201. ^ a b "Charles IV (of France)". Encarta. Microsoft Corporation. 2008. ^ a b c Sumption, p.97. ^ a b Echols and Williams, p.87. ^ Echols and Williams, p.328. ^ a b Lord, p.47. ^ a b c Lord, p.48. ^ a b Wagner, p.250. ^ Kibler, p.201; Nirenberg, p.67. ^ a b c d Holmes, p.16. ^ Holmes, p.16; Kibler, p.201. ^ a b Lord, p.46. ^ Kibler, p.314; Sumption, p.98. ^ a b Kibler, p.477. ^ a b TeBrake, p.50. ^ Vauchez, Dobson and Lapidge, p.288. ^ a b Kibler, p.206. ^ a b Geanakoplos, p.48. ^ a b Sumption, p.106. ^ "Official website: Les Rois maudits (2005 miniseries)" (in French). 2005. Archived from the original on 15 August 2009. Retrieved 25 July 2015. ^ "Les Rois maudits: Casting de la saison 1" (in French). AlloCiné. 2005. Archived from the original on 19 December 2014. Retrieved 25 July 2015. ^ a b Bulletin de la Société de l'histoire de France (in French). J. Renouard. 1855. p. 98. Ainsworth, Peter. Representing Royalty: Kings, Queens and Captains in Some Early Fifteenth Century Manuscripts of Froissart's Chroniques. in Kooper (ed) 2006. Echols, Anne and Marty Williams. (1992) An Annotated Index of Medieval Women. Princeton: Markus Wiener. Geanakoplos, Deno. (1975) Byzantium and the Crusades: 1261–1354. in Hazard (ed) 1975. Given-Wilson, Chris and Nigel Saul (eds). (2002) Fourteenth Century England, Volume 2. Woodridge: Boydell Press. Hassall, Arthur. (2009) France Mediaeval and Modern: a History. BiblioBazaar. Hazard, Harry H. (ed), (1975) A History of the Crusades: The Fourteenth and Fifteenth Centuries, Volume 3. Wisconsin: Wisconsin Press. Holmes, George. (2000) Europe, Hierarchy and Revolt, 1320–1450, 2nd edition. Oxford: Blackwell. Housley, Norman. (1986) The Avignon papacy and the Crusades, 1305–1378. Oxford: Clarendon Press. Kibler, William W. (1995) Medieval France: an Encyclopedia. London: Routledge. Kooper, Erik (ed). (2006) The Medieval Chronicle IV. Amsterdam: Rodopi. Lord, Carla. (2002) Queen Isabella at the Court of France. in Given-Wilson and Saul (eds) (2002). Neillands, Robin. (2001) The Hundred Years War. London: Routledge. Nirenberg, David. (1996) Communities of Violence: Persecution of Minorities in the Middle Ages. Princeton: Princeton University Press. Sumption, Jonathan. (1999) The Hundred Years War: Trial by Battle. Philadelphia: Pennsylvania University Press. TeBrake, William Henry. (1994) A Plague of Insurrection: Popular Politics and Peasant Revolt in Flanders, 1323–1328. Philadelphia: University of Pennsylvania Press. Vauchez, André, Richard Barrie Dobson and Michael Lapidge. (2000) Encyclopedia of the Middle Ages, Volume 1. Cambridge: James Clark. Wagner, John. A. (2006) Encyclopedia of the Hundred Years War. Westport: Greenwood Press. Wikimedia Commons has media related to Charles IV of France. AAlso King of Aragon. FAlso King of France. Philip VI, called the Fortunate and of Valois, was the first King of France from the House of Valois. He reigned from 1328 until his death, Philips reign was dominated by the consequences of a succession dispute. It was held in France, that Edward was ineligible to inherit the French throne through the line according to the ancient Salic Law. 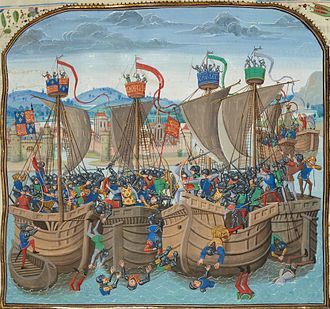 The result was the beginning of the Hundred Years War in 1337, after initial successes at sea, Philips navy was annihilated at the Battle of Sluys in 1340, ensuring that the war would occur on the continent. The English took another decisive advantage at the Battle of Crécy, while the Black Death struck France, in 1349, Philip VI bought the Dauphiné from its ruined ruler Humbert II and entrusted the government of this province to his grandson Charles. Philip VI died in 1350 and was succeeded by his son John II the Good, little is recorded about Philips childhood and youth, in large part because he was of minor royal birth. Philips father Charles, Count of Valois, the brother of King Philip IV of France, had striven throughout his life to gain a throne for himself but was never successful. He died in 1325, leaving his eldest son Philip as heir to the counties of Anjou, Maine, in 1328, Philips first cousin Charles IV died without a son and with his widow Jeanne dÉvreux pregnant. Philip was one of the two claimants to the throne. The other was King Edward III of England, who was the son of Charless sister Isabella, the question arose whether Isabella should have been able to transmit a claim that she herself did not possess. The assemblies of the French barons and prelates and the University of Paris decided that males who derive their right to inheritance through their mother should be excluded according to Salic Law. 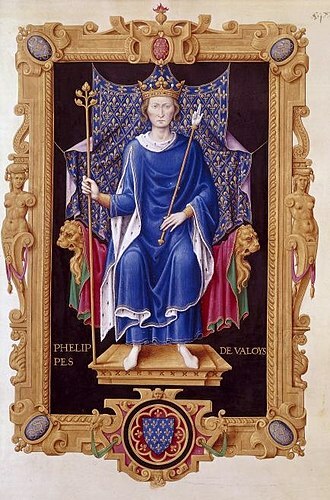 He formally held the regency from 9 February 1328 until 1 April, upon this birth, Philip was named king and crowned at the Cathedral in Reims on 29 May 1328. 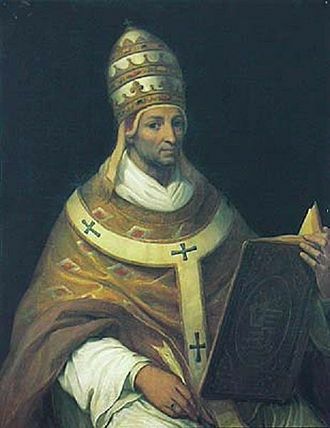 After his elevation to the throne, Philip sent the Abbot of Fécamp, Pierre Roger, after a subsequent second summons from Philip, Edward arrived at the Cathedral of Amiens on 6 June 1329 and worded his vows in such a way to cause more disputes in years. Guillaume Tirel, known as Taillevent, was an important figure in the early history of French cuisine. He was cook to the Court of France at the time of the first Valois kings and his first position was enfant de cuisine to Queen Jeanne dÉvreux. From 1326 he was queux, head chef, to Philip VI, in 1347, he became squire to the Dauphin de Viennois and his queux in 1349. In 1355 he became squire to the Duke of Normandy, in 1359 his queux, the Duke of Normandy became Charles V in 1368 and Tirel continued in his service. From 1381 he was in service to Charles VI and he is generally considered one of the first truly professional master chefs. He died in 1395 at around 80 years of age and it had an inestimable influence on subsequent books on French cuisine and is important to food historians as a detailed source on the medieval cuisine of northern France. During the reign of Philip VI Taillevent was an influence in the rise of imperial favor for the strong red wines being produced in the south of France as well as those coming out of Burgundy. Jean Fouquet was a preeminent French painter of the 15th century, a master of both panel painting and manuscript illumination, and the apparent inventor of the portrait miniature. He was the first French artist to travel to Italy and experience first-hand the early Italian Renaissance, little is known of his life, but it is certain that he was in Italy before 1447, when he executed a portrait of Pope Eugene IV, who died that year. He worked for the French court, including Charles VII, the treasurer Étienne Chevalier, near the end of his career, he became court painter to Louis XI. His work can be associated with the French courts attempt to solidify French national identity in the wake of its struggle with England in the Hundred Years War. One example is when Fouquet depicts Charles VII as one of the three magi and this is one of the very few portraits of the king. According to some sources, the other two magi are the Dauphin Louis, future Louis XI, and his brother, far more numerous are his illuminated books and miniatures. The Musée Condé in Chantilly contains forty miniatures from the Hours of Étienne Chevalier, Fouquet illuminated a copy of the Grandes Chroniques de France, for an unknown patron, thought to be either Charles VII or someone else at the royal court. Also from Fouquets hand are eleven of the fourteen miniatures illustrating a translation of Josephus at the Bibliothèque Nationale, the Melun Diptych One of Fouquets most important paintings is the Melun Diptych, formerly in Melun cathedral. The left wing of the diptych depicts Étienne Chevalier with his patron saint St. Stephen, the right wing shows a pale Virgin and Child surrounded by red and blue angels and is now at the Royal Museum of Fine Arts, Antwerp. Since at least the seventeenth century, the Virgin has been recognized as a portrait of Agnès Sorel, the Louvre has his oil portraits of Charles VII, of Count Wilczek, and of Guillaume Jouvenel des Ursins, and a portrait drawing in crayon. Melun Diptych Book of Hours of Simon de Varie Chisholm, Hugh, ed. The Tour de Nesle was a tower in Paris where much of the adultery was said to have occurred. The scandal led to torture and imprisonments, with lasting consequences for the years of the Capetian dynasty. The royal scandal occurred at the end of the reign of Philip IV. Just before the crisis broke, Philip had been engaged in the liquidation of the order of the Knights Templar in France, Philip IV had three sons, Louis and Charles. As was customary for the period, all three were married with an eye for political gain and his youngest son Charles married Blanche, another of Ottos daughters, in 1308. The three marriages had fared differently, Charles, a relatively conservative, strait-laced and stiff-necked individual, had an unexceptional marriage. Isabellas marriage proved difficult, largely due to Edwards intimate relationship with his friend and possible lover. Isabella looked frequently to her father for help addressing the problems in her English marriage, most accounts of the scandal begin with the visit of the king and queen of England to the queens father in France during 1313. During the visit and Charles had had a puppet show put on for their guests. Isabella concluded that the pair must have been carrying on an illicit affair, Philip IV placed the knights under surveillance for a period, and the scandal began to take shape. The accusations centred on suggestions that Blanche and Margaret had been drinking and engaging in adultery with Gautier, the Tour de Nesle was an old guard tower in Paris next to the river Seine and had been bought by Philip IV in 1308. Most historians have tended to conclude that the accusations against Blanche and Margaret were probably true, some contemporary chroniclers suggested that Philip IVs unpopular chamberlain Enguerrand de Marigny might have been responsible for framing the knights and women involved. Following the period of surveillance, Philip IV broke the news of the accusations publicly, there are some suggestions that Gautier and Philippe dAunay may have attempted to escape to England but in due course both knights were interrogated and tortured by French officials. Isabella of France, sometimes described as the She-Wolf of France, was Queen of England as the wife of Edward II, and regent of England from 1326 until 1330. She was the youngest surviving child and only surviving daughter of Philip IV of France, Queen Isabella was notable at the time for her beauty, diplomatic skills, and intelligence. 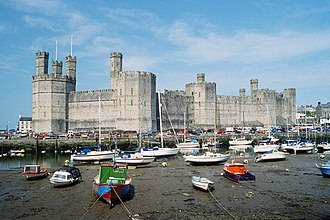 Isabella arrived in England at the age of 12 during a period of growing conflict between the king and the powerful baronial factions, Isabella could not tolerate Hugh Despenser and by 1325 her marriage to Edward was at a breaking point. Travelling to France under the guise of a mission, Isabella began an affair with Roger Mortimer. The Queen returned to England with a mercenary army in 1326. Isabella deposed Edward, becoming regent on behalf of her son, many have believed that Isabella arranged the murder of Edward II. In 1330, Isabella’s son Edward III deposed Mortimer in turn, taking back his authority, the Queen was not punished and lived for many years in considerable style—although not at Edward III’s court—until her death in 1358. Isabella became a popular femme fatale figure in plays and literature over the years, usually portrayed as a beautiful but cruel, manipulative figure. Isabella was born in Paris on an uncertain date – on the basis of the chroniclers and she is described as born in 1292 in the Annals of Wigmore, and Piers Langtoft agrees, claiming that she was 7 years old in 1299. The French chroniclers Guillaume de Nangis and Thomas Walsingham describe her as 12 years old at the time of her marriage in January 1308, placing her birth between January 1295 and of 1296. A papal dispensation by Clement V in November 1305 permitted her immediate marriage by proxy and her parents were King Philip IV of France and Queen Joan I of Navarre, her brothers Louis and Charles became kings of France. Isabella was born into a family that ruled the most powerful state in Western Europe. Indeed, he appeared almost obsessed about building up wealth and lands, Isabellas mother died when Isabella was still quite young, some contemporaries suspected Philip IV of her murder, albeit probably incorrectly. Philip V, the Tall, was King of France and King of Navarre. He reigned from 1316 to his death and was the monarch of the main line of the House of Capet. 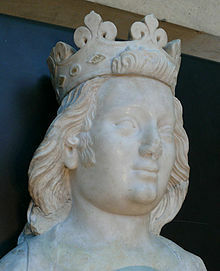 As the second son of king Philip IV, he was entitled to an appanage, when Louis died in 1316, he left a daughter and a pregnant wife, Clementia of Hungary. Philip the Tall successfully claimed the regency, Queen Clementia gave birth to a boy, who was proclaimed king as John I, but the infant king lived only for five days. At the death of his nephew, Philip immediately had himself crowned at Reims, his legitimacy was challenged by the party of Louis X’s daughter Joan. The succession of Philip, instead of Joan, set the precedent for the French royal succession that would be known as the Salic law. A spontaneous popular crusade started in Normandy in 1320 aiming to liberate Iberia from the Moors, instead the angry populace marched to the south attacking castles, royal officials, priests and Jews. Philip V engaged in a series of reforms intended to improve the management of the kingdom. These reforms included the creation of an independent Court of Finances, the standardization of weights and measures, Philip V died from dysentery in 1322 without a male heir and was succeeded by his younger brother Charles IV. Philip was born in Lyon, the son of King Philip IV of France. His father granted to him the county of Poitiers in appanage, modern historians have described Philip V as a man of considerable intelligence and sensitivity, and the wisest and politically most apt of Philip IVs three sons. At the heart of the problems for both Philip IV and Louis X were taxes and the difficulty in raising them outside of crises, Philip married Joan, the eldest daughter of Count Otto IV of Burgundy, in 1307. The original plan had been for Louis X to marry Joan, Philip went to great lengths not only to endow Joan with lands and money but to try to ensure that these gifts were irrevocable in the event of his early death. Amongst the various gifts were a palace, additional money for jewels, and her servants and the property of all the Jews in Burgundy, which he gave to Joan in 1318. Charles of Valois was the third son of Philip III of France and Isabella of Aragon. He was a member of the House of Capet and founded the House of Valois, in 1284, he was created Count of Valois by his father and, in 1290, received the title of Count of Anjou from his marriage to Margaret of Anjou. Moderately intelligent, disproportionately ambitious and quite greedy, Charles of Valois collected principalities and he had as appanage the counties of Valois, Alençon and Perche. But he was son, brother-in-law, son-in-law, and uncle of kings or of queens, moreover, after his death, Charles thus dreamed of more and sought all his life for a crown he never obtained. In 1285, the pope recognized him as King of Aragon, as son of his mother, in opposition to King Peter III, Charles married Marguerite of Sicily, daughter of the Neapolitan king, in order to re-enforce his position in Sicily, supported by the Pope. He would never dare to use the seal which was made on this occasion. His principal quality was to be a military leader. He commanded effectively in Flanders in 1297, the king quickly deduced that his brother could conduct an expedition in Italy against Frederick II of Sicily. The affair was ended by the peace of Caltabellotta, Charles dreamed at the same time of the imperial crown and married in 1301 Catherine de Courtenay, who was a titular empress. But it needed the connivance of the Pope, which he obtained by his expedition to Italy, Charles was back in shape to seek a new crown when the German king Albert of Habsburg was murdered in 1308. Charless brother, who did not wish to take the risk himself of a check and probably thought that a French puppet on the throne would be a good thing for France. 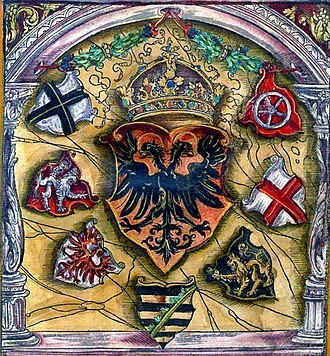 The candidacy was defeated with the election of Henry VII as German king, Charles continued to dream of the eastern crown of the Courtenays. Thus it was he who directed in 1311 the royal embassy to the conferences of Tournai with the Flemish, he quarreled there with his brothers chamberlain Enguerrand de Marigny, Charles did not pardon the affront and would continue the vendetta against Marigny after the kings death. Blanche of Burgundy was Queen of France and Navarre for a few months in 1322 through her marriage to King Charles IV the Fair. The daughter of Count Otto IV of Burgundy and Countess Mahaut of Artois, eight years before her husbands accession to the thrones, Blanche was arrested and found guilty of adultery with a Norman knight. Her sister-in-law, Margaret of Burgundy, suffered the same fate, Blanche was imprisoned until she became queen, when she was moved to the coast of Normandy. The date and place of her death are unknown, the fact that she died was simply mentioned on the occasion of her husbands third marriage in April 1326. Blanche was the daughter of Otto IV, Count of Burgundy. Her father died in 1302, leaving the county to Blanches younger brother, the same year, Louis married Margaret of Burgundy. The negotiations were successful and on 23 September 1307, the eleven-year-old Blanche, the marriage ceremony was hastily performed at Countess Mahauts castle in Hesdin in January 1308. In 1313, the Countess of la Marches sister-in-law and brother-in-law, Queen Isabella and King Edward II of England, Isabella presented her brothers and sisters-in-law with embroidered coin purses. From that she concluded that the brothers were having relationships with her sisters-in-law, when she visited Paris again in 1314, she informed King Philip about her suspicions. Blanches sister Joan was accused of hiding the affair and of participating in it, after a certain period of time, King Philip ordered the arrest of all his daughters-in-law and the knights. Following torture, the knights confessed to adultery and admitted that it had lasted three years, the Countess of la Marche and the Queen of Navarre were tried before the Paris Parlement and were found guilty of adultery. Their heads were shaven and both were sentenced to life imprisonment underground in Château Gaillard, while their lovers were condemned to death, despite her disgrace, Blanche remained in contact with her ambitious mother and often received gifts from her. King Philip, severely shocked by the scandal, died within a year, now queen of France, died imprisoned soon thereafter, probably murdered. Louiss reign was cut short by his sudden death, Philip the Tall and Blanches sister Joan became king and queen of France and Navarre. Otho IV, Count of Burgundy was the son of Hugh de Châlons and Adelaide, Countess Palatine of Burgundy. Via his mother, he was a grandson of Countess Beatrice II of Burgundy, via his father, he was descended from another branch of the Counts of Burgundy. Upon his fathers death in 1266/1267, he became Count of Châlons and his mother, died on March 8,1279, and Otto inherited the County. However, he was unable to secure power in the County until 1295. His son and elder daughter Jeanne II would eventually succeed him in the County of Burgundy and his wife Mahaut drew up a contract on June 4,1312 with the famous tomb maker Jean Pepin de Huy to make a tomb. The contract specifies a tomb made of stone and alabaster, Otto was to be shown as an armed knight with a shield and armor. A lion was shown beneath his feet, two angels would support the pillow under his head. This tomb no longer exists today, but the designs were preserved and he married Philippa of Bar in 1271. He married his wife, Mahaut of Artois, in 1285. It can refer to Philippe III de Croÿ and Philippe III, Duke of Orléans. Philip III, called the Bold, was King of France from 1270 to 1285, Philip proved indecisive, soft in nature, and timid. The strong personalities of his parents apparently crushed him, and policies of his father dominated him, people called him the Bold on the basis of his abilities in combat and on horseback and not on the basis of his political or personal character. He was pious but not cultivated and he followed the suggestions of others, first of Pierre de La Broce and of his uncle King Charles I of Naples and Albania. His father, Louis IX, died in Tunis during the Eighth Crusade, who was accompanying him, came back to France to claim his throne and was anointed at Reims in 1271. Philip made numerous territorial acquisitions during his reign, the most notable being the County of Toulouse which was annexed to the Crown lands of France in 1271. Following the Sicilian Vespers, a rebellion triggered by Peter III of Aragon against Philips uncle Charles I of Naples, Philip was forced to retreat and died from dysentry in Perpignan in 1285. He was succeeded by his son Philip the Fair, Philip was born in Poissy to King Saint Louis IX of France and Margaret of Provence, queen consort of France. As a younger son, Philip was not expected to rule a kingdom, at the death of his elder brother Louis in 1260, he became the heir to the throne. He was 15 years old and has less skill than his brother, being of a character, submissive and versatile. Pope Urban IV released Philip from his oath on June 6,1263, from 1268 Pierre de La Brosse became mentor. Saint Louis provided him his own advice, writing in particular Enseignements and he received a very faith-oriented education. Guillaume dErcuis was his chaplain before being the tutor of his son, as Count of Orléans, he accompanied his father to the Eighth Crusade in Tunis,1270. After taking Carthage, the army was struck by an epidemic of dysentery and his brother John Tristan, Count of Valois died first, on August 3, and on August 25 the king died. To prevent putrefaction of the remains of the sovereign, they recoursed to Mos Teutonicus, Philip, 25 years old, was proclaimed king in Tunis. Homage of Edward I (kneeling) to Philip IV (seated). As Duke of Aquitaine, Edward was a vassal to the French king. Painting made in 15th century. 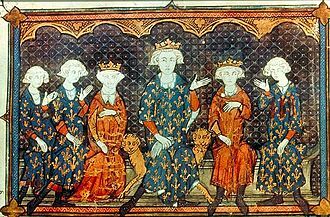 Isabella's French family, depicted in 1315: l-r: Isabella's brothers, Charles and Philip, Isabella herself, her father, Philip IV, her brother Louis, and her uncle, Charles of Valois. Bibliothèque Nationale de France. Isabella was able to come to an understanding with her husband's first favourite Piers Gaveston, shown here lying dead at the feet of Guy de Beauchamp, in a 15th-century representation. Tynemouth Priory, seen from the sea, where Isabella escaped the Scots army following the disastrous campaign of 1322. Left wing of the Melun Diptych depicts Etienne Chevalier with his patron saint St. Stephen. Gemäldegalerie, Berlin. The Coronation of Henry VII by three cardinals. Tomb of Henry VII, Codex Balduini Trevirensis (ca 1340). King Francis I of France, Charles V, and Cardinal Alessandro Farnese enter Paris under a canopy of estate in 1540, in a fresco by Taddeo Zuccari. Charles V of France enters Paris after his coronation at Rheims in 1364. 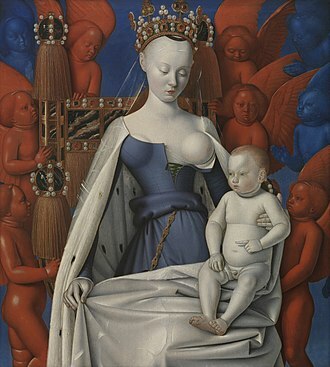 Later depiction by Jean Fouquet. Later woodcut after Mantegna, with hand-colouring, showing the culmination of the Triumphs of Caesar. Historical reenactment in Fontainebleau of the bicentenary of Napoleon's Farewell to the Old Guard, April 20th of 2014. Napoleon is going down the famous stairs of Fontainebleau castle to meet with the Old Guard. Philip pursued a successful diplomatic and dynastic solution to the long running tensions with Flanders. Louis being crowned with his second wife, Clementia of Hungary. Louis campaigning in Flanders, where he sought a military solution to the ongoing problem of the "immensely wealthy", quasi-autonomous province of France. Painting circa 15th century.